Discussions Magazine Music Blog: DISNEYLAND: SPAZ reviews The Legacy Collection! DISNEYLAND: SPAZ reviews The Legacy Collection! Music may be subjective but we all share similar experiences in regards to what we like and don’t like. While most tend to ‘grow out’ of certain styles of music, the songs we enjoyed when we were young informs the music we enjoy when we are older. We may not actively seek out certain songs when we are adults, yet when we hear them, they bring those feelings of nostalgia. This could be anything from Sesame Street songs to Christmas carols – anything we bounced along to when we were just wee little toddlers. Anyone lucky enough to visit Disneyland when they were a kid remembers everything about it – the sights, the smells, the rides and the music. Disneyland BOC (before over-crowding) was magical. It still is… if you can worm your way around the park without being trampled by the crowds! The music that soundtracks the attractions and different lands in Disneyland has always been just as important as the music in their many animated and live action features from classics like Snow White & The Seven Dwarfs to Frozen. The music that Disney has created over the years has been, for the most part, an integral part of who and what they are today. There have been some misses along the way but those are so few and far between that they are not worth mentioning here. 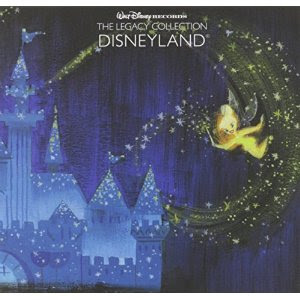 The most memorable music heard within the walls of the Magic Kingdom is gathered together on a three CD set entitled The Legacy Collection: Disneyland. There have been other collections in the past but this 2015 set spans the ‘50s to 2010’s and is perhaps the most important souvenir you can buy outside of the park. Released to coincide with Disneyland’s 60th Anniversary celebration, The Legacy Collection is a wonderful anthology of songs that will instantly open up your memory banks and whisk you back in time to a place that still enchants people every single day. Many previous collections have featured snippets from “Grim Grinning Ghosts” (The Haunted Mansion) and “Yo Ho (A Pirate’s Life For Me” (Pirates Of The Caribbean) but this set contains full length versions that last almost as long as the ride itself. Add in music from the Tiki Room, the Indiana Jones ride, Great Moments With Mr. Lincoln, Star Tours, Space Mountain and loads of other great rides and lands, the first two discs are nearly flawless. You can almost smell the chlorinated water while “Splash Mountain Medley” plays. Or feel the ground tremble during “Honey I Shrunk The Audience Theme”. Speaking of which, the disc contains music from attractions that are sadly no longer with us (i.e. : Honey….) as well as brand new attractions that today’s generation will appreciate more than us old fogeys who remember E tickets. The third disc is where you’ll find many of California Adventure’s signature tunes alongside a few nighttime favorites like “Fantasmic” and the long version of “The Main Street Electrical Parade”. Though I’m not as familiar with much of the more recent music and attractions, there are millions of people who will embrace every note. The Legacy Collection: Disneyland will please grandparents and grandkids and there is definitely something for everyone here. If you can’t make it to Disneyland today, throw this on instead and relive the memories of your youth. Listening to this release is like opening up a scrapbook in your mind and revisiting the park any time you want! Sometimes, that is what it is all about!